These fire ants are reddish in color and or most usually about 1/4-inch long. Although most ants are recognizable, some winged ants are often confused with termites, especially during the termite swarming season. The front pair of wings on ants is larger than the hind pair, while the four wings of termites are approximately the same size. Ants have "elbowed" antennae and a "thin waist" (narrow between the thorax and first abdominal segments). In termites, the thorax and abdomen are broadly connected and their antennae are straight and hair like. Also, fire ants vary in size -1/16 to almost 1/4 inch long - with the largest workers 2 or 3 times larger than the smallest. Fire ants are sensitive to vibration or movement and tend to sting when the object they are on moves. They are quite aggressive and will sting intruders repeatedly. So, when fire ants swarm up a person's leg and the person jerks or moves, one ant stings and this triggers the other ants to sting in response. Although they have been know to kill young wildlife, only a very small portion of the human population will experience lethal allergic reactions. However, watch the affected area for excessive swelling, itching or redness, or other symptoms like shortness of breath, thickening of the tongue, sweating, etc. these symptoms could indicate a systemic allergic reaction. Treat stings as you would stings of other insects and keep them clean and intact to avoid secondary infections. If you are uncertain how your body will react, seek medical help immediately and be sure to let someone know that you have been stung. It is best to be with other people that can assist you, if necessary. Fire ants are from South America. They entered the U.S. through Mobile, Alabama, probably in soil used for ships' ballasts and were accidentally introduced around the 1930's and have been spreading since. When ants are found in trees, they are mainly using the trees as a nesting place and any mounds occurring at the base of the trunk are probably not causing any damage to well established trees; they may be helpful by preying on other insects that do feed on tree parts and they could reduce compaction by tunneling in the soil. The nests that fire ants build are approximately 1-2 feet in diameter and 1/2-foot high. During the day, ants dig deep into the ground and come out to forage at night. Because of this ants are more of an indoor problem now. Using individual mound treatments during hot, dry conditions is not a good idea because mounds are absent and/or the ants are deep in the ground. In the past, gasoline was usually poured onto the fire ant piles, but this usually does not kill the entire colony, is dangerous to handle, and kills any plant material it touches. Also, residue remains in the soil and may leach or run off into ground and/or surface water. Laundry piles are also a convenient place that presents lots of tunnels for ants. Often, reports of ants in laundry occur following a flood or severe drought. Ants are even observed in utility rooms, bathrooms, or near water heaters where they have access to the area from outside. When it floods they move into any good dark place, but in drought conditions they tend to move to moist areas. These fire ants are omnivorous but they have been know the eat meat, greasy, and sweet materials. 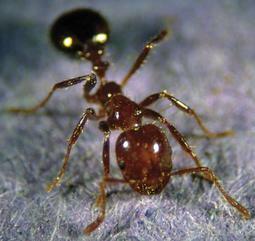 It has also been observed that fire ants removed the rubber insulation from telephone wires. They also feed on invertebrates, oily, sugary foods and sterile eggs, ticks, boll weevils, sugar cane borer, corn ear worms, lacewings, and corn crops. The process from being an egg to becoming an adult is only about a 30 days ordeal. A fire ant queen produces a variety of eggs: sterile eggs to be eaten, fertilized eggs that will produce sterile female workers, fertilized eggs that will produce ants capable of reproduction, and unfertilized eggs that will produce males. The environment and worker behavior are the two factors that determine what type of eggs are to be produced. Also, this reproduction process is dependent on the weather. A few days after a rainstorm, the workers will open holes in the nest during the morning hours to let the reproductive fire ants out for a mating flight. The ideal conditions for this behavior are a temperature above 24 degrees Celsius, low sun, and low wind. After mating, the male dies and the fertilized female selects a potential site to establish a new colony. After landing, she breaks off her wings and builds a vertical tunnel; however, her success rate is only 1% since most females perish from predators at this stage. If the female is successful, she seals herself off to lay 10-20 eggs a day which become the first workers of the new colony. These workers are uniformly small as their food supply is regurgitated oil from her crop (the female does not eat at this time). Once the workers mature the mated female becomes a queen attended by the workers. Within six to twelve months, the queen is capable of producing approximately 800 eggs per day, every day, workers live up to 180 days, and the Queens can live between two to six years. Over time, a mature colony develops and can contain up to 250,000 workers.